at the Vatican, March 21, 1979. ''This is, as far as I know, the first time any artist of note has undertaken such a project. Pope John Paul II warmly received Stanley Roseman and Ronald Davis at the Vatican on March 21, the feast day of St. Benedict of Nursia. Roseman and Davis presented the Pope with a gift of the beautiful drawing Brother Florian Playing the Recorder from the Benedictine Abbey of Tyniec, near Krakow. Pope John Paul had been Archbishop of Krakow before his election as Pope. 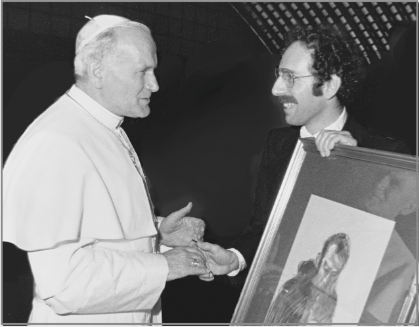 Heartily shaking Roseman's hand, Pope John Paul II said he was ''deeply moved'' by Roseman's paintings and drawings, a selection of which he previously had seen in photographs prior to his meeting the artist, as well as from the gift of the drawing that Roseman presented to the Pontiff. 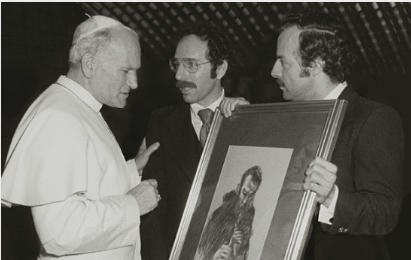 Pope John Paul, who had a personal interest in the arts from the days of his youth, greatly encouraged Roseman in his work. between Christians and Jews and all people of goodwill." The memorable occasion was preceded by a gracious invitation to Roseman and Davis from the Abbot Primate of the Benedictine Order, Dom Victor Dammertz, to be guests at his residence in Rome. and Ronald Davis (right) at the Vatican, March 21, 1979. Pope John Paul II said that he was "deeply moved"
by the artist's work on the monastic life. The Polish Pope was in the first six months of his pontificate in 1979 and had not yet returned to his homeland. Acutely aware of the difficulty for those outside the Eastern Bloc Countries to obtain the necessary entry visas as well as to travel on their own behind the then Iron Curtain, Pope John Paul expressed his appreciation to Roseman and Davis for their having made the journey to Poland. Roseman's chalk drawing on gray paper of Brother Florian, with fine facial features, dark hair, and beard, portrays the young Polish monk absorbed in his music. Pope John Paul II was born Karol Józef Wojtyla on May 18, 1920, in Wadowice, Poland. He was elected to the papacy in 1978. Pope John Paul II passed away on April 2, 2005, and was beatified in 2011. Pope John Paul II was canonized on April 27, 2014. Dom Victor Dammertz, O.S.B, Abbot Primate of the Order of St. Benedictine, invited Roseman and Davis as his guests at the abbot's residence, the Badia Primaziale Sant'Anselmo, in Rome, in late winter of 1979. Roseman made the journey to monasteries across Europe with Davis, who wrote the letters to monasteries to introduce his colleague's work, relate the artist's interest in monastic life as a subject for his paintings and drawings, and make a request for a sojourn. Davis helped plan an itinerary and as he had done for their Lappland journey, took on the responsibilities of organizing the project on the monastic life. 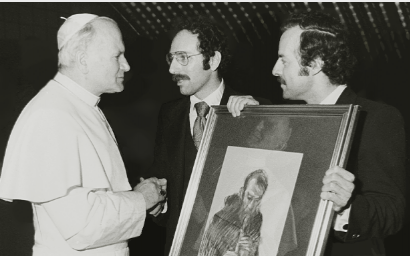 On the feast day of St. Benedict of Nursia (c.480-c.547), whose Rule called The Rule of St. Benedict is the basis of monastic observance in the Western Church, Pope John Paul II warmly received at the Vatican on March 21, 1979, Stanley Roseman, who is of the Jewish faith, and his colleague Ronald Davis, of the Roman Catholic faith.